The Boston Shatnez Laboratory is a member of the International Association of Professional Shatnez Laboratories (IAOPSL). It services the Greater Boston area through Shatnez testing, educational seminars and consumer shatnez alerts. The Boston Shatnez Laboratory was started by Rabbi Zvi Solomon in 2007. 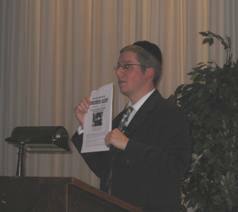 Rabbi Solomon was trained and certified in Shatnez testing by Rabbis Yosef Sayagh and Yoel Shochet of IAOPSL. Rabbi Solomon is an alumnus of Ner Israel Rabbinical college and Yeshivas Mir Jerusalem. He is currently a member of the Kollel of Greater Boston and lectures on various Torah topics for the Boston Jewish community.